Some people are not going to like this article. That’s fine though. We may just have to agree to disagree in the end, because this is an argument that has been going on forever on trading forums without ever finding any common ground. I’m talking of course about Fibonacci levels, and their use in trading. Just a chart of today’s price action in EUR/USD. From this H1 chart, we can see how well trend lines works, also that 61.8% retracements works and that S/R in charts works. Three good reasons to take this trade in my opinion, with very low risk and great rewards. Since London closed high up and the Asian session traded far lower, to the traders in London this might just be seen as a large gap for them, just my thought on the subject and an idea for exit target. 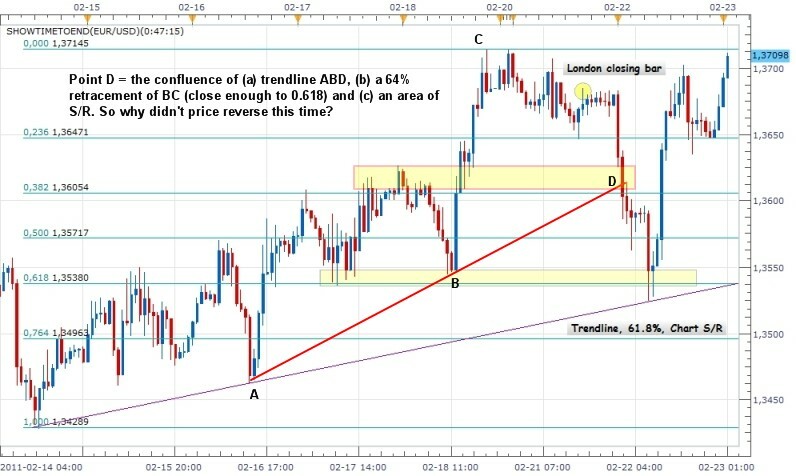 How come you do not find trend lines and Fibonacci levels useful in your trading, if I understand you correctly? I do not know of any tools that are so exact as trend lines and second are Fib-levels, chart S/R work also very well and is usually found close to major Fib-levels. Let’s consider fibonacci levels… why don’t I believe in fibonacci levels as having some predictive ability to identify turning points? Simply because, having an understanding of the true nature of price action, there is no place for fibonacci levels in the reality of price movement. The same goes for any other type of mathematical guess at future S/R levels – floor pivots, camarilla equations and whatever else is out there. They add no value. The real reason that price turned at this point, and the ONLY reason, is because of a shift in the supply / demand dynamics of the market. Bearish orderflow was overcome by bullish orderflow, most likely as a combination of selling drying up at these levels, and an increase in buying. With supply (selling) unable to meet demand (buying), price rallied. There is NO other reason. It wasn’t because of the fibonacci level. It was supply / demand. Everything else is illusion. Bullish or bearish orderflow is a result of the sentiment of market participants. The reversal at B is a result of a shift in sentiment leading to a change of net orderflow from bearish to bullish. Why did that occur? Numerous reasons. We can never know the decision making of all market participants. Certainly though, the fib level may have played a part in the decision making of some market participants (self-fulfilling prophecy… but only because other traders also transacted in this area for other reasons). Likewise for the trendline. And for any of a million other potential reasons. I’d suggest a larger proportion (than the fib and trendline groups) of change in sentiment would be due to the S/R level. It’s actually a great level. Previous resistance turned support. And look at the strength of the move away from the area last time it touched (prior to B). Having now retraced through A as a result of bearish orderflow, price was pushed through the support level to test lower prices. 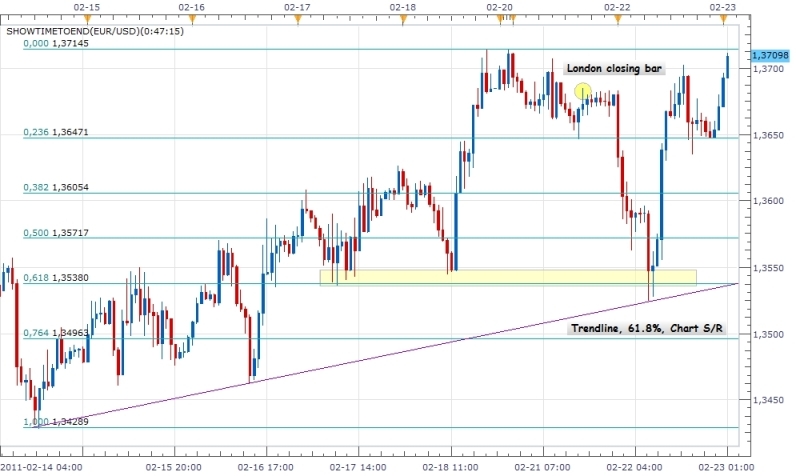 Breakout traders would have entered short below the 1.3550 area (and previous swing lows). Failure to attract wider bearish support though, resulted in a failure to continue in the downward direction. 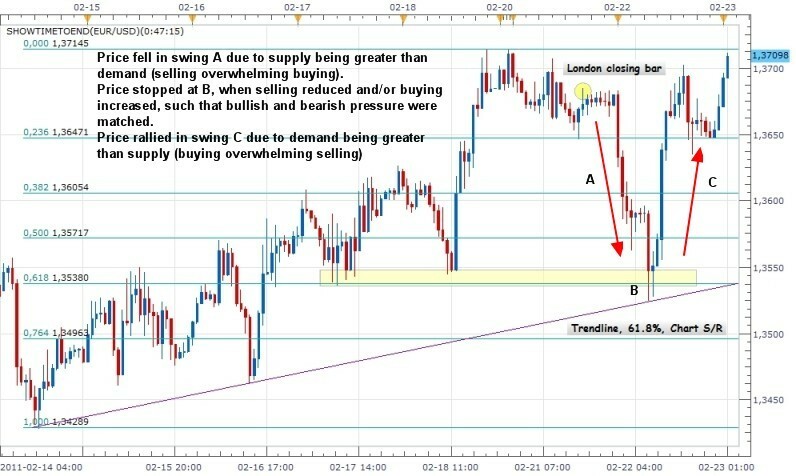 As price rallies from B, it’s the shorts covering their position (stopped out) which provide the bullish strength shown in C.
Looking at price action from the perspective of supply and demand, and considering its movement from the way that other traders decisions will impact orderflow… there’s just no need for fibs. Fibonacci adds nothing to this analysis. There was no need to guess that B would provide support. Just to know that if price did get there, and failed to continue lower, it would quite likely rally with some strength. Study price and what makes it move. Study supply and demand. Study the dual auction process, and maybe some market profile. Study volume 2 of the YTC Price Action Trader. You’ll understand why price is moving. You’ll understand where potential areas of opposing orderflow will exist in the market. And you’ll quite likely never use fibonacci levels again. It’s the difference between analysis based on the true nature of price action, versus analysis based on illusion. For every fib example you provide which works, I’ll be happy to provide two fib examples which don’t. Or even better, let’s look beyond just fibs. Since you’ve provided an area of confluence of a fib, a trendline and area of S/R, I’ll provide two of them as well. And I don’t even need to move to different charts. Here we have point D, at the end of trendline ABD, which intersects nicely with an area of S/R around 1.3610, right in the vicinity of our 61.8% fib (based off BC). Sweet! Unfortunately the market doesn’t reverse at that point. Maybe if I’d measured the fib from the extension AC. Nope… that would have put point D in the vicinity of our 38.2% fib. Now we have even more confluence, and price still should have rallied. Let’s just try another example. Point E is the point of confluence of trendline ABCE, the area of S/R at 1.3525, and a retracement to either the 23.6 fib (from AD) and the 38.2 fib (from CD). Ok… this one is a little messy. The levels don’t intersect exactly. But had the price rallied from above the hammer at E, all the fib traders would have claimed it as a level holding, and further proof of concept, arguing that it’s not an exact science and that it’s all in the general area so it’s close enough. So I’m reserving my right to use the same argument. It’s close enough for my purposes. Once again… no joy. Price punched further through E before reversing. Because for every 61.8 fib which works, it means price didn’t reverse at the 23.6 fib, or the 38.2 fib, or the 50 fib. The inaccuracy that is accepted in trading the levels, means that essentially EVERY reversal occurs at a fib level. Note the point of reversal in your chart. You termed it a 61.8% retracement. Note though that the price actually penetrated this level by approximately 12 pips, placing us actually closer to a 66% retracement. This is of course to be expected. The intent of the levels is not that they are an impenetrable barrier that will stop price to the pip. The problem here though is that fibonacci traders will typically accept anything that goes half way to the next level as evidence that this level has worked. And then anything beyond that half way point will be considered evidence that the next level has worked (see later for confirmation bias). So, in their eyes, every reversal is now proof that fibonacci works. The fibonacci inaccuracy has simply created a grid over our chart in which every reversal occurs in one of the grid areas. A man-made grid based on mathematical percentages has no basis for market reality. Have a look at ANY chart that supposedly shows a fib level. And note the number of occurrences when the turning point is actually somewhere around midway between two fib levels. I consider fibs to be in the category of “place enough lines on a chart and price will have to turn near one of them”. Random levels produce just as good results. Mark them on charts and you’ll find example after example that shows they work. Pick any other random percentage retracements, and you’ll also find numerous examples for them (once again see below for confirmation bias). It’s just as valid (or invalid depending on beliefs), especially when allowing the inaccuracy we mentioned earlier. Why then do fibonacci levels appear so accurate? The tendency to search for and overweight evidence that supports one’s own belief. Given the inaccuracy that is accepted in the trading of the levels, it’s incredibly simple to find examples that appear to have worked. Having been shown this convincing evidence, and particularly when taught this by a “market expert”, one develops a belief that fibonacci levels could potentially be a valid tool for extracting profits from the market. From there, human nature kicks in, allowing you to sight example after example of reversals which occurred at fib levels. And discounting those which don’t work. Fibs appear to work, as a result of a human perceptual (and information processing) error. Ok… not quite a reason… but something that annoys me. Do some research on fibonacci numbers. Not as they relate to trading, but the actual theory behind the numbers. 50% is not a fibonacci ratio. So where the hell does 50 come from? If the market is meant to be guided by some universal fibonacci theorem… you can’t go just throwing in an extra level and hoping no-one will notice. I’m a bit of a maths nerd. But that’s not 6.18 reasons? Reasons one and four pretty much sum up my thoughts on fibonacci, and why I see no value in them as an analysis method. Fibonacci makes no sense when considered from the position of supply/demand. And there is no evidence of these levels providing any greater edge than when using a random selection of levels. Any indicator will show success some of the time. The question is whether or not its use improves your edge. I’d suggest that any indicator based on illusion provides little value with respect to improving edge. You commented, “chart S/R work also very well and is usually found close to major Fib-levels”. I’d suggest that you’re seeing this backwards. It’s not the S/R levels which are close to fib levels, but rather the fact that when a fib level does appear to have worked it’s simply because it just happens to coincide with an area of S/R. S/R is reality based. The fibs are illusion. Now, having said all this, I will accept that there are many traders using fibonacci levels, who enjoy exceptional degrees of success and profitability. If you’re getting positive results through the use of fibs, then ignore all my facetious comments and continue trading as you have been so far. 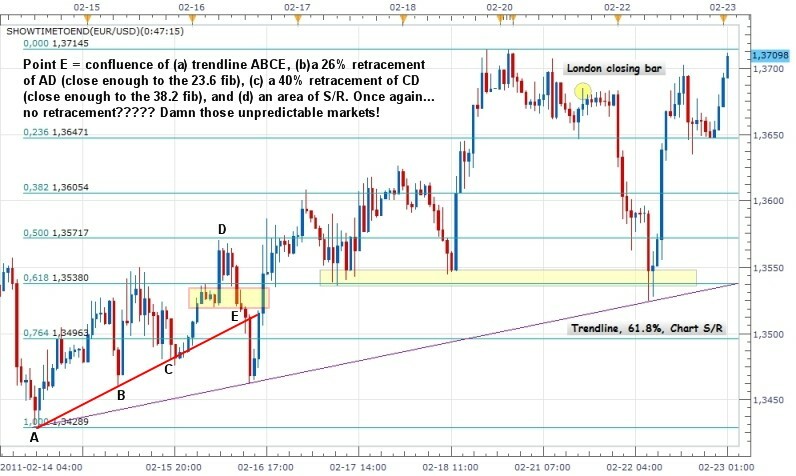 The fact is… you did find a great setup area through using your fib, trendline and S/R confluence area. My belief though, regarding those who are consistently profitable with fibs, is that their edge is not through some predictive ability associated with these levels but rather in how they use the levels. If you use them simply as points of reference, with your main focus on assessing how price behaves at each level, in order to identify shifts in the supply/demand balance and develop a bias for future orderflow, then I expect they should work fine. But I also expect you would be able to do this equally as well with random levels. Or with real S/R. So, why not just forget the illusion and use real S/R – areas of previously proven supply/demand imbalance? Now… trendlines… that’s a whole other story which should probably be addressed through another article. To summarise my concerns in one word though… subjectivity. Did you ever do a follow-up article on trendlines? The reason I ask is because I’ve previously thought of trendlines as angled support and resistance lines. But based on the notion of supply and demand this can’t be correct. Secondly, how do I stop myself seeing price action framed by trendlines and trend channels every time I view a chart. Thanks. Bart, I don’t use trendlines for exactly this reason. They don’t have any validity from a supply/demand perspective. And so I haven’t done any articles either (my focus is usually on techniques and methods that I personally use). That being said, trendlines can still be useful for defining an approximate area that a pullback should reach, provided the underlying sentiment has not changed in the market. Kind of like the measured move concept. But the line itself is meaningless, apart from defining this “general area of anticipated pullback”.